The Happy Pear's Cashew, White Bean and Sage Pâté makes the perfect canapé or starter. 2. Using a mandoline or sharp knife, slice the large beetroot into thin, even, round slices. They will shrink by half while baking, so you have to use large beetroot for this, as these slices will be the ‘cracker’ base that the pâté will be served on. Brush the beetroot slices with 2 tablespoons of the oil using a pastry brush. 3. Put the beetroot slices on two baking trays, using more trays if needed. Bake in the oven for 30 to 40 minutes, turning the slices over halfway through the cooking time, until they are dry and crisp. Allow to sit for 30 minutes, as they will continue to dry out once they come out of the oven. 4. Meanwhile, heat 1 tablespoon of the oil in a medium pan on a high heat. Add the mushrooms and cook for 3 to 4 minutes, stirring regularly. They should have reduced in volume by approximately half. Add the tamari or soy sauce, stirring to coat the mushrooms, and cook for 1 to 2 minutes. Remove the pan from the heat. 5. Put the cooked mushrooms in a food processor along with the beans, cashews, garlic, sage, lemon juice, 1 tablespoon of olive oil and the salt and pepper. Blend to your desired consistency, thinning with another tablespoon of oil or another squeeze of lemon juice if needed. 6. 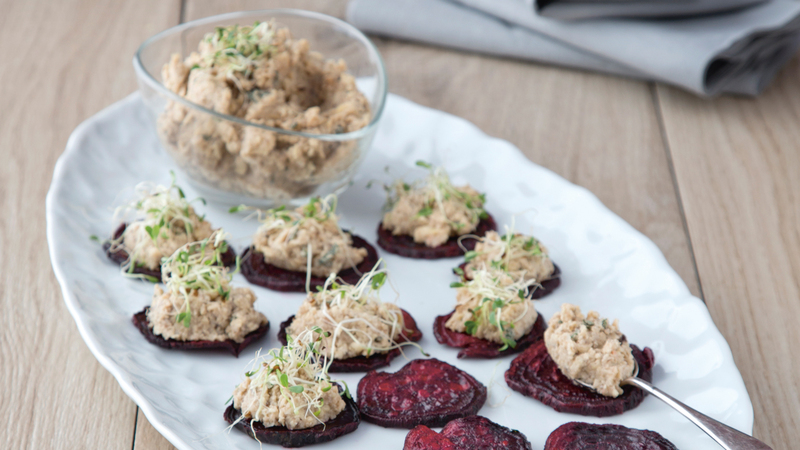 To serve these as individual canapés, lay out the beet slices on a large serving platter or board and spoon 1 tablespoon of the pâté on top of each slice. Serve any extra pâté in a bowl alongside and garnish the prepared slices with alfalfa sprouts or snipped fresh chives.